Radium Chalet, Radium Hot Springs, B.C. Radium Chalet , from our secluded Mountain side location and private viewing decks, you will number yourself with the chosen few to capture the splendor of the Canadian Rockies and the lush beauty of the Columbia Valley. 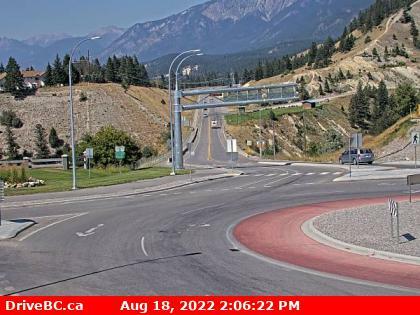 Radium Chalet, located 600 feet above the Valley and boast the most spectacular view of any in Radium. Units are air conditioned, 2 room suites, new very comfortable pillow top queen mattresses, combination baths, kitchenettes, fireplaces, private balconies, Cable TV, DVD, telephone, internet. Jacuzzi,conference/games room, laundry, barbecue area. Enjoy a relaxing, all you can eat, healthy HOT breakfast every morning of Fresh baked Bread, Scrambled Eggs, Pancakes, Bacon, Sausage, Sauteed Vegetables, Yogurt, Juice, Fresh Fruit, Choices of Hot Chocolate, Green Tea, Regular Tea, Hot Apple Cider and the Best Columbian Coffee in the Columbia Valley. We are well versed on the many and varied activities both winter and summer in our valley and would like to help you plan your stay. Bookings can be made online or call on our toll free number. All suits at the Radium Chalet have a separate bedroom complete with a queen size bed and radio/alarm clock. Each suite has a kitchenette including a refrigerator, microwave oven, sink and small table. The living room area has a queen size hide-a-bed and cable TV. 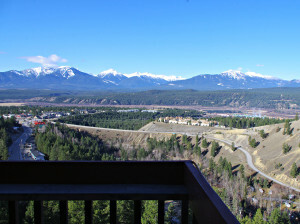 French doors lead from the living room out onto private balconies which offer beautiful views of Radium Hot Springs, the Columbia Valley and surrounding Rocky Mountains. All rooms have fireplaces and air conditioning. Radium Chalet has a distinctive style that evolved from classic mountain hotels; rugged and bold, yet refined and comfortable. Elements of traditional chalet architecture, such as the white stucco arches, wood decks and rails, and large sloping roofs have been combined with contemporary construction methods, design and engineering to form this Canadian Rocky Mountain Chalet. Radium Chalet is an ideal location for holidays, anniversaries, reunions, or any other group get togethers.